How I learned to stop worrying and Love my little German Bomb. Unlike almost everyone in the car world, I like Chris Bangle. His designs were interesting and it broke BMW from the staid 3-sausage sizes model in the late 90s and early 2000s. But I have to say, while i loved my E90, the Audi is probably more visually pleasing. It is crisp and dynamic, and its compact dimensions made it look like it is ready to pounce even when it is standing still. I have always been a fan of Audi styling since the first generation TT, but the S3 looks purposeful, and the lighting graphics both front and back are simply goregeous. Interior design has always been Audi’s strength and the S3 is no exception. I did not get a particularly well-optioned car (the only option was the technology package), but while it is a bit plasticky, the fit and finish of the car is excellent. The plastic is soft and pleasing to the fingers and I have heard no rattle and squeaks so far at just under 13,000 miles. The seats are comfortable and I LOVED the round air vents control as it “clicks” close at a turn of the aluminium bezel. There is plenty of storage space and the seats fold flat for the occasional Costco run. That said, the interior is not without it’s drawbacks. The backseat is tight, and they are really only designed for two skinny people, preferably those who had their lower legs cut off (or as my insurance call it “4 door for insurance purposes only”). I also found it odd that for a sporty German car, memory seats are not part of the package. The seats are electric and adjustable every which way, but I have to readjust the seats every time after a car wash or if my hubby borrows the car. Even our 2017 CR-V has seat memory. The S3 is powered by a 2 liter turbo 4. It is my first 4 cylinder, my first turbo, and hands down the most powerful car I have ever owned. It squirts forward with the urgency of a scalded rat. The turbo lag is not bad, but it is certainly noticeable, the rush of power push you into the back of the seat. On the highway, the car is so stable that it is easy to drive much faster than you thought you are, and overtaking slowpokes is a breeze. The transmission is a DCT. It has 6 speeds, which is not bad, but it takes a while to get used to it compared to a traditional automatic. For example, while most auto cars would roll forward the second you release the brakes, the Audi takes a second to roll forward when you lift off at stop lights. In D mode, the DCT behaves pretty normally, like an normal automatic. But in dynamic mode or S mode, the transmission likes to hang on to the lowest gear possible before upshifting, and when you slow down from high speed (like getting into an off ramp from the highway), the downshifts is a bit clunky and you can feel the car jump a little bit as it slow down at stops. I learned to avoid using S mode when I am driving in city traffic. The S3 offers 4 different drive modes: 3 pre-sets and 1 customizable. It controls your engine and DCT (soft shifts vs hard shifts), your engine sounds (loud or louder), your steering (heavier or lighter) and your quattro (mostly FWD or more AWD). You can rely on the car to make decisions for you in Auto mode, keep it softer and easier in comfort mode, or go balls-out in Dynamic mode. I would not recommend Dynamic mode for city driving or even commuting, but it is great for highways and twisting back roads. 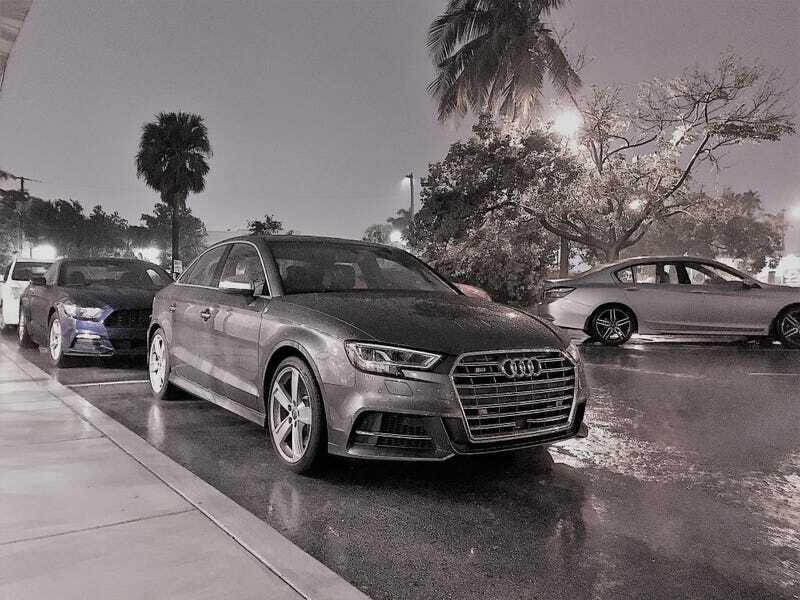 When I spoke with Tom about replacing my E90, I told him specifically that I want a car that drives and handles like my little Beemer, and while it is not exactly the same, the S3 is more than capable to live up to the standard set by its predecessor. The steering is sharp and responsive but not twitchy, even on rutted and pockmarked stretches of I-95 in Miami. It is a electric rack, but it is heavy enough to feel substantial, unlike some of its competitors. The suspension absorbs most bumps without compliant, but you can still feel the road and all its imperfections without a harsh ride. On twisty roads, the car has very neutral and direct handling characteristics at high speeds, never unpredictable or out of control, and the quattro system certainly did a great job at masking the front-heavy aspects of the car. My car came with the Technology package, with includes the fantastic virtual cockpit: a giant configurable screen in front of you that shows you everything from your navigation to your fuel consumption. One click on the steering wheel would shrink the tach and speedo to give you more screen space for extra information, like direction for navigation to media selection. The car has two USB ports, one in the center console compartment, and one in front of the shifter. It comes with a media interface for my iPod and Apple Carplay for my iPhone. An optional subscription let me integrate the onboard navi with Google Maps for better navigation and traffic avoidance. Backup camera and parking sensors made parking a breeze and helps with the limited visibility thanks to the bunker-style design that is so popular these days. The MMI knob has finger writing sensor so you can write in your search without twirling the knob a million times. Being a iDrive user for the last decade, I learned the MMI system in under 5 minutes. In terms of running costs, I am happy to say that the Audi is reasonably fuel efficient. It has a smaller tank at 13 gallons and change, but it regularly achieves 30+ mpg on the highway and 25-26 mpg in mixed highway and city traffic. The automatic stop-start takes time to get used to, but it can be switched off. 3 months and 5000 miles later, I can say without reservation that I really liked my Audi. Sure there are some weird quirks here and there with the DCT and some missing standard features for a car that would have cost 46K and change new, but the looks, the handling and the engine made up for its deficits. The Virtual Cockpit is fun and the car can be as comfortable and as fierce as you want to drive it. I am still on edge about future maintenance costs, but for now, this little German Bomb is a perfect car for me.